Carnival Corporation announced U.S. GAAP net income of $1.7 billion, or $2.41 diluted EPS, for the third quarter of 2018, higher than U.S. GAAP net income for the third quarter of 2017 of $1.3 billion, or $1.83 diluted EPS. Third quarter 2018 adjusted net income of $1.7 billion, or $2.36 adjusted EPS, was higher than adjusted net income of $1.7 billion, or $2.29 adjusted EPS, for the third quarter of 2017. Adjusted net income excludes unrealized gains and losses on fuel derivatives and other net charges, totaling $34 million in net gains for the third quarter of 2018 and unrealized gains on fuel derivatives of $65 million and impairments and other net charges of $395 million for the third quarter of 2017. Revenues for the third quarter of 2018 were $5.8 billion, higher than the $5.5 billion in the prior year. Also in the third quarter, the company authorized the replenishment of its $1.0 billion share repurchase program covering both Carnival Corporation common stock traded on the New York Stock Exchange and Carnival plc ordinary shares traded on the London Stock Exchange. Carnival Corporation & plc President and Chief Executive Officer Arnold Donald stated: "Strong execution delivered the highest quarterly performance in our company's history, overcoming fuel and currency headwinds. At the same time, our strong cash flow and balance sheet enabled us to accelerate our opportunistic share repurchase program, investing almost $750 million in Carnival stock since the beginning of the third quarter, bringing the total investment to $4.4 billion in just three years, and leading to the second replenishment of our $1.0 billion repurchase program this year alone." Gross revenue yields (revenue per available lower berth day or "ALBD") increased 4.0 percent. In constant currency, net revenue yields increased 2.9 percent, better than June guidance of up 1.5 to 2.5 percent. Gross cruise costs including fuel per ALBD decreased 2.6 percent. In constant currency, net cruise costs excluding fuel per ALBD increased 2.7 percent, better than June guidance of up 3.0 to 4.0 percent, principally due to the timing of expenses between quarters. Changes in fuel prices (including realized fuel derivatives) and currency exchange rates decreased earnings by $0.08 per share. Highlights from the third quarter include the signing of an agreement between Princess Cruises and Italian shipbuilder Fincantieri S.p.A to build two new liquefied natural gas ("LNG") cruise ships that will be delivered in 2023 and 2025, bringing the total to 11 LNG cruise ships on order. P&O Cruises (Australia) announced the sale of Pacific Jewel, which will leave the fleet in March 2019; Holland America Line announced the sale of Prinsendam, which will leave the fleet in July 2019; and P&O Cruises (UK) announced the sale of Oriana, which will leave the fleet in August 2019, bringing the total to four ships leaving the fleet in 2019. Seabourn received approval to begin sailing to Cuba from Miami and San Juan, becoming our third cruise brand currently approved to sail to Cuba. The company released its 2017 Sustainability Report and achieved its goal to reduce its carbon footprint by 25 percent three years ahead of schedule. Based on the third quarter results and booking strength for the fourth quarter of 2018, the company now expects full year 2018 net revenue yields in constant currency to be up approximately 3.5 percent compared to the prior year, better than June guidance of up approximately 3.0 percent. The company expects full year net cruise costs excluding fuel per ALBD in constant currency compared to the prior year to be up approximately 1.5 percent, versus June guidance of approximately 1.0 percent, primarily due to the accounting treatment for ships sold during the quarter. Changes in fuel prices (including realized fuel derivatives) and currency exchange rates are expected to decrease earnings by $0.06 per share compared to June guidance and $0.18 per share compared to the prior year. Taking the above factors into consideration, the company expects full year 2018 adjusted earnings per share to be in the range of $4.21 to $4.25 compared to 2017 adjusted earnings per share of $3.82. Donald commented: "We are on track to achieve double digit return on invested capital in 2018 as we deliver upon our strategy to create demand in excess of measured capacity growth, all while containing costs and leveraging our industry leading scale. Going forward, we remain on a path toward continued growth in earnings and returns, driven to a greater degree by capacity increases as we add more efficient ships, replacing less efficient capacity. We believe the plans we have put in place will maximize returns to shareholders over time as we continue to execute in an industry that is both under-penetrated and capacity constrained." Donald added, "At the same time, we remain committed to returning cash to shareholders as evidenced by the growth in our recurring dividend, currently distributing $1.4 billion annually, accompanied by our recently replenished share repurchase program." Fourth quarter constant currency net revenue yields are expected to be up approximately 1.5 to 2.5 percent compared to fourth quarter 2017. Net cruise costs excluding fuel per ALBD in constant currency for the fourth quarter are expected to decrease by approximately 1.0 to 2.0 percent compared to fourth quarter 2017. Changes in fuel prices (including realized derivatives) and currency exchange rates are expected to decrease earnings by $0.11 per share compared to the prior year. Based on the above factors, the company expects adjusted earnings per share for the fourth quarter 2018 to be in the range of $0.65 to $0.69 versus 2017 adjusted earnings per share of $0.63. 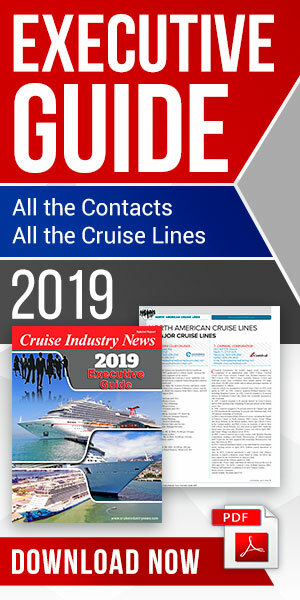 At this time, cumulative advanced bookings for the first half of 2019 are ahead of the prior year at prices that are in line with the prior year, Carnival said. Since June, booking volumes for the first half of next year have been running significantly higher than the prior year at lower prices compared to the prior year. More recently, during the first half of September, booking volumes for the first half of next year have also been running significantly higher than the prior year but at higher prices compared to the prior year. Based on these booking trends, the company expects continued net revenue yield improvement for the first half of 2019, albeit with increases less than the net revenue yield guidance for the fourth quarter of 2018, primarily due to comparisons to a very strong prior year.